Great tour...the ride is a bit brutal but friendships with other passengers and conversation helps to pass the time. It's about 4-hours each way on the bus after about 1-hour circling the Old Quarter to pickup other passengers can't really be avoided but does add to the time. The boat ride is really great and very enjoyable passing through three tunnels. I was slightly disappointed the it did not look like the picture being advertised with rice fields on both sides, instead it was through what is probably a better landscape of projecting rocks and caves. I can only imagine that rice fields would get old viewing them from the surface. The bike ride is short and not very spectacular...is a single road with a short walk at the end with not much to see. The adventure is in riding some Vietnam standard bicycles along the road. It would be good to have a bit more time to stop and take more pictures or explore some of the side streets. Overall a good trip and our guide, Tony, did a great job of engaging everyone. 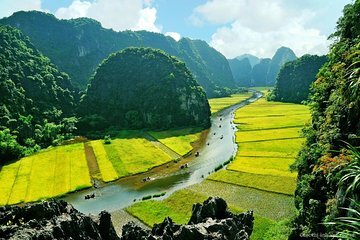 Truly beautiful place, excellent tour guide and driver, a must do in Vietnam. Enjoyable tour and highlight of Hanoi trip. On land version of Halong Bay, indeed. Timely pick up, timely hotel drop off, decent lunch and something I recommend highly. 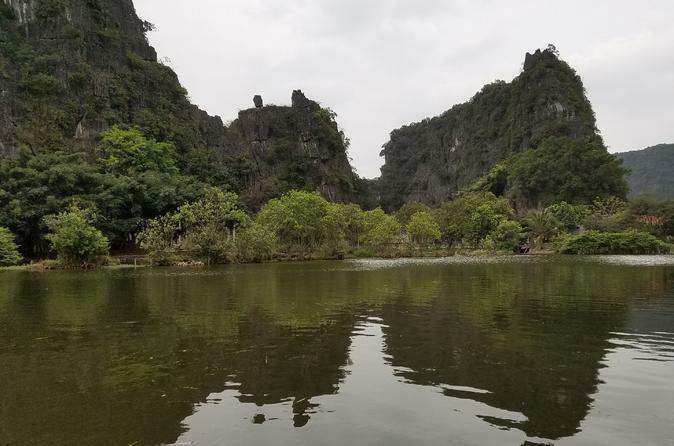 Watching Kong on the way back home was added bonus, Tam Coc is where the Kong was shot. The tour was really good. Only downside was the lunch, not much choice. Our guide was brilliant well worth doing the private tour. A really interesting tour full of activity from the amazing boat ride with foot rowing drivers through amazing countryside to the bike ride along the rice fields. Our guide Ngok was very informative and would highly recommend it. Well organized day trip with very well prepared guides. The riding in the boat it's long but relaxing and enjoyable the bike tour is amazing, the rice fields and the view are simply unforgettable. The tour was well planned. The duration was good. But it was a 2 hours ride to the location. The guide has good knowledge about everything even tho he is young. The only thing can be improved is the lunch buffet. Amount is plenty but not the taste. Quick pick up, small group tour, good lunch, relax boat trip! You will see local woman row boat by her leg. She could not speak English but she is really nice! She invited to buy some embroidery pictures which made by hand. It s cheaper than the things sold at the shop on the way. Tour guide is nice and very caring. The Boat Trip and Bike Trip is awesome . The Food was not up to the mark but the trip is worth it. Too Many tour people are coming to the same restraunt and suggestion will be to move to another food for lunch or just have a different timing. Always carry your raincoat or umberlla to that place , even if the Hanoi is sunny . The tour would be better if taken during spring - autumn rather then winter time. Although there is not cold winter, fields are not green and water is very muddy. Simply: it does not look like on the picture! However, the tour is scheduled and planned correctly and our guide was nice.